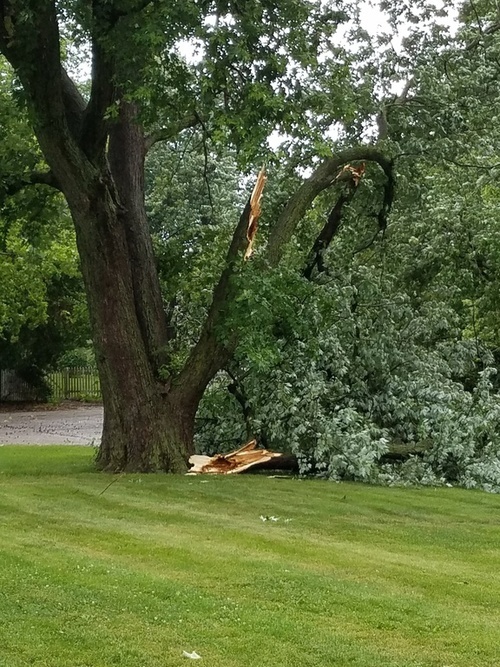 This entry was posted in Seasonal and tagged losing a tree, silver maple, storm aftermath. Bookmark the permalink. Debbie, this breaks my heart because I have such a soft spot for trees. I love them. I think of them and see them as being powerful beings; containing so much wisdom. Whenever I’m feeling out of sorts, sitting under a tree in the park for an hour makes me feel so much better. I find trees to be so healing. Your poem is just beautiful. And as you shared, it’s the ” good memories” that trees hold that is the true loss. 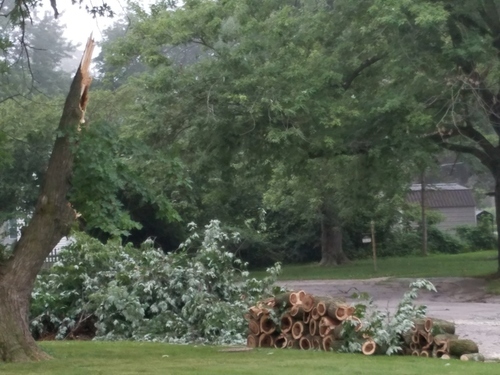 Oh shoot–Mother Nature did a number on that sweet tree but what memories are associated with it. Beautiful poem. Lovely poem! What a shame about the tree. But tell me, what on earth is toilet papering?? Beautiful poem. Sorry for the loss of the tree. Thank you, John. Summer feels way hotter without trees! I laughed and laughed at the question about tp-ing. Been there, done that, and received that little gift a time or two. And you’re right: it’s not such a big deal, unless it rains. Sorry about the tree, but I’m glad to know that you’re thinking of taking it down. We understand that people and animals have allotted life spans, but plants do, too. When their time has come, they break and fray and rot, and they can do a good bit of damage when they’re in that condition. On the other hand, when the birches in front of our family home had to come down, my mother kept some of the logs and used them to decorate the fireplace in summer. When she sold the house, I took the logs, and they lived with me for several years, decorating my summer fireplace. Finally, I moved to a place without a fireplace, and the logs went away. But I still miss them. If I had it to do over, I’d still have them! I have some fond memories of being the TP’er and some not-so-fond memories of cleaning it all up! It never ceases to amaze me how creative folks can get in where they choose to “decorate,” Ha! I suppose, as long as it’s just toilet paper — not eggs — it’s all in good fun. Thanks for sympathizing about this tree. Since its logs are mostly hollow, they probably wouldn’t be very good even for decoration (and my neighbor said the ones they stacked had lots of nasty grubworms inside, yuck!). I like the idea of keeping the birch logs though. We lost so many beautiful trees on our block because of hurricane Sandy. It changes the whole landscape. So I understand about the tree. So sad, Tanya. I remember seeing the Mississippi Gulf Coast after Katrina — all those gorgeous live oaks, magnolias, and crepe myrtles uprooted like toothpicks. It takes a LONG time to replenish the landscape after such a wicked storm. I hope your neighborhood is trying to plant replacement trees. This is so lovely Debbie. It evoked so many happy memories of my girlhood and my favorite tree. Me, too, Virginia! Thanks for empathizing. I guess we’ve all had “special” trees in our lives, trees we remember with deep affection. It’s going to cost a big chunk of change to remove this one (it’s extremely tall), but the greater harm would be having it topple into the house! It is so hard to see something like this happen. I just love mature trees. Now to get used to the new view. Hugs. Ha, the “new view” is my neighbor’s house!! Thanks so much for saying so, my friend!!! It’s very sad when a loved, old tree goes. It’s beautiful. Very sad. Thank you, Val, for empathizing. Now I’m off to visit your online home and browse some of your posts!